Well done girls! 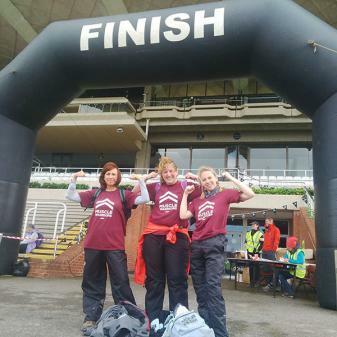 On Saturday 10 May 2014, three courageous MuscleWarriorette’s laced their walking boots and battled through high winds and rain to successfully finish this year’s 2014 JUST WALK Challenge on the South Downs. Pictured above: An exhausted but extremely elated Tracy Hunt, Sue McGrath and Gemma McGrath delivering the charities distinctive Muscle Warrior salute, a visible symbol of hope, courage, strength and joy for all those suffering from the muscle wasting disease muscular dystrophy.  <p”>As of 27 May 2014, donations via their respective Virgin Money Giving fundraising pages totalled a magnificent £1724.86 – donations have been made by family, friends and supporters that included £50.00 from TV Presenter and charity Patron Lorraine Kelly and £100 from BRIT Founder and former British Provost Officer Phil Packer MBE. The charity’s unique #657APPEAL attracted many single donations of £6.57 and £65.70; funds raised will go towards the charities growing Muscle Dream activities. 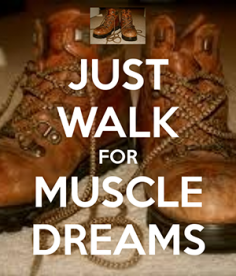 Contact the charity if you would like to join our Muscle Warrior tribe on SATURDAY 9th MAY 2015 for our 2nd JUST WALK Challenge – we will shortly be announcing specific details on our Upcoming Events page. This is your opportunity to walk the beautiful South Downs starting and finishing at Goodwood Racecourse near Chichester. 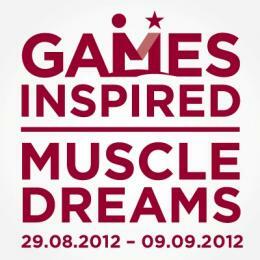 With a distance to suit every fitness level or goal, it’s a fun and easy way to raise money for Muscle Dreams. Check back soon for further event details.